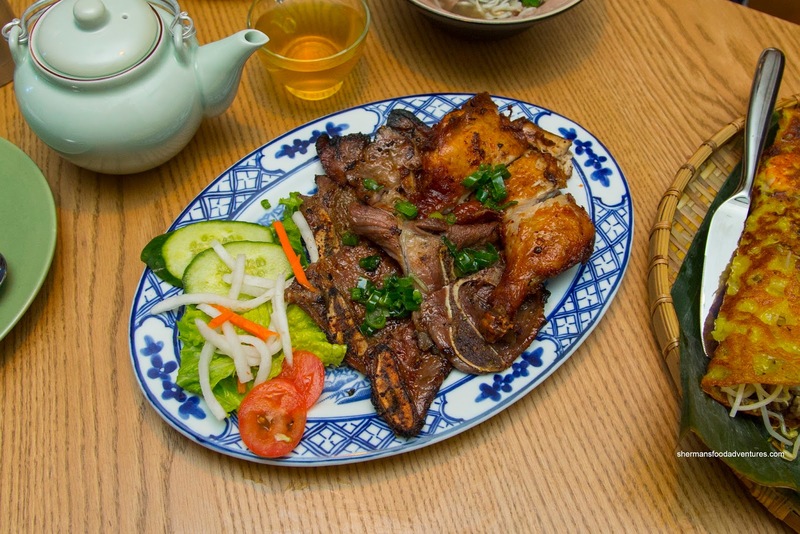 Really, if you've been to one Vietnamese restaurant in town, you've probably been given a preview to all of the other ones. 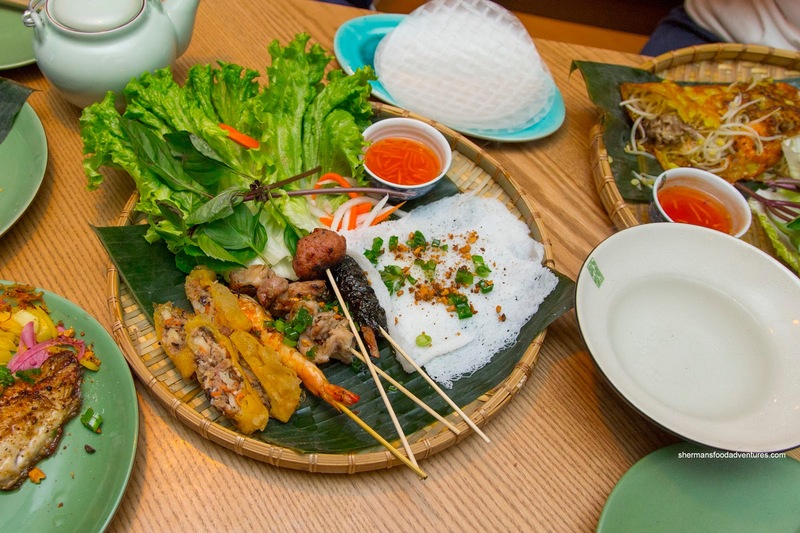 Usually minimalist and adorned with linoleum floors, dusty plastic plants and mirrors galore, the Vietnamese Pho joint does its best impersonation of a hermit crab. They take over whatever restaurant there was before and generally do very little to renovate. Don't even get me started on the washrooms... Oh and if there is a test regarding what is on the menu, well, we've had enough practice to ace it. 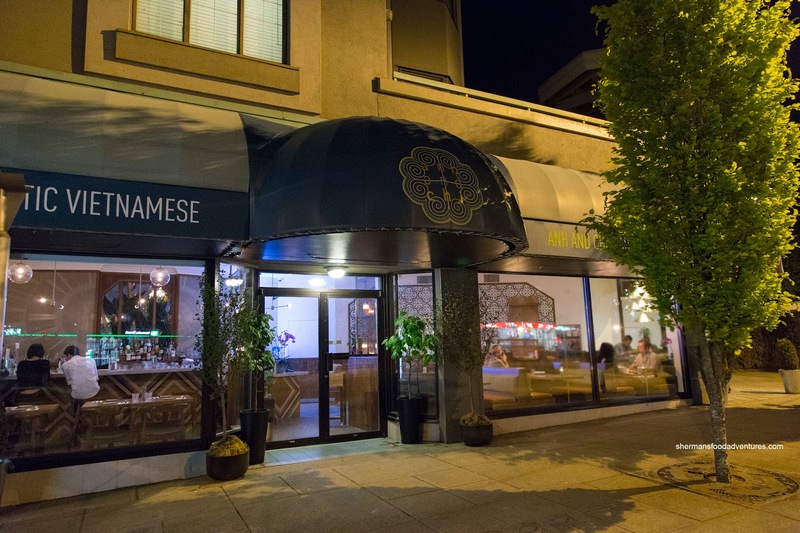 But wait, rising from the ashes of the ol' Pho Hoang is the newly renovated and reinvented Anh + Chi (owner passed the reigns to the children). Seeing how it has suddenly become the social media darling since it opened last week, Boss Woman, Bam Bam, Pebbles, Bear and introducing R2D2, joined me to see what the fuss was all about after our softball game. 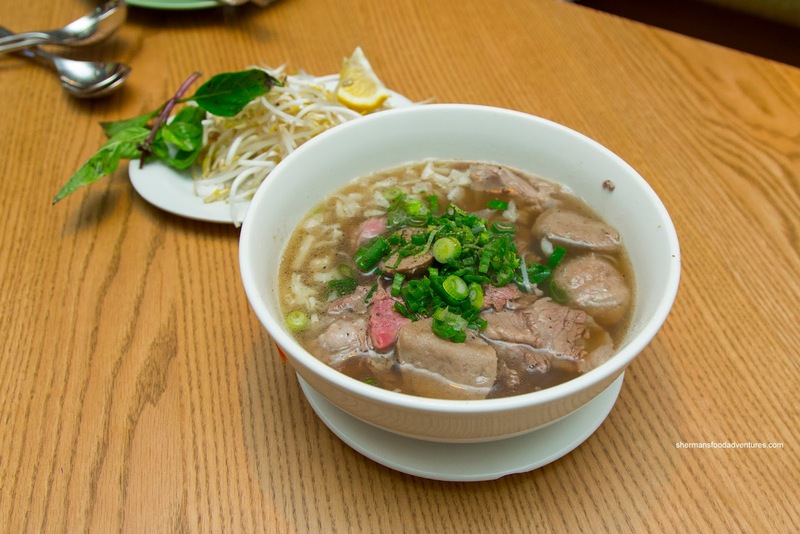 We started off conservatively with the Pho Hoang which was modest in size. This was pretty standard stuff with a broth that was clean, but a touch bland. The noodles were still chewy and didn't clump up too much. As for the meats, they were sliced thin and tender. Next up was the Cơm Chiên consisting of wok-fried rice with egg and chicken. As much as this didn't impress visually, it was on point in terms of texture and taste. The rice was chewy and nutty while being properly seasoned. The well-charred chunks of chicken added a certain smokiness to the dish. 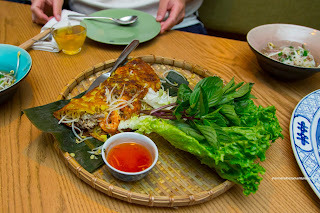 One of my favourite items was the Bánh Xèo or Vietnamese crisp rice flour, coconut milk & turmeric crêpe filled with pork, prawn, bean sprouts and mung bean. Textually, the thin and crispy crepe held up to the wet ingredients. I thought the prawn and pork were on point while the sprouts were cooked-through, but still were crunchy and not overly wet. Of all the things on the menu, I thought Bear would choose the short ribs on rice, but he suggested the Chú Tư or trio of meat including lemongrass chicken, short ribs and pork chop. Ah yes, all meat and no filler (including his beloved short ribs). This was on point in terms of meat texture as the chicken was juicy while the pork and short ribs were sufficiently tender. The dish did suffer from underseasoning though. 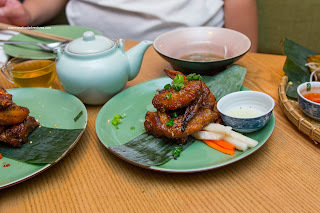 We went ahead and tried both flavours of their Cánh Gà including the Chili Fish Sauce Wings and Butter Garlic Wings. 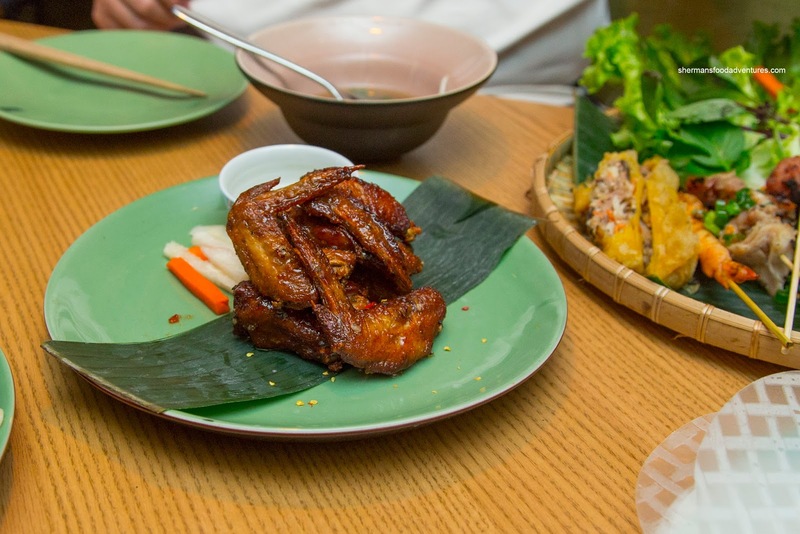 The wings featured crispy skin that was well-rendered. The meat wasn't exactly juicy nor was it dry either. 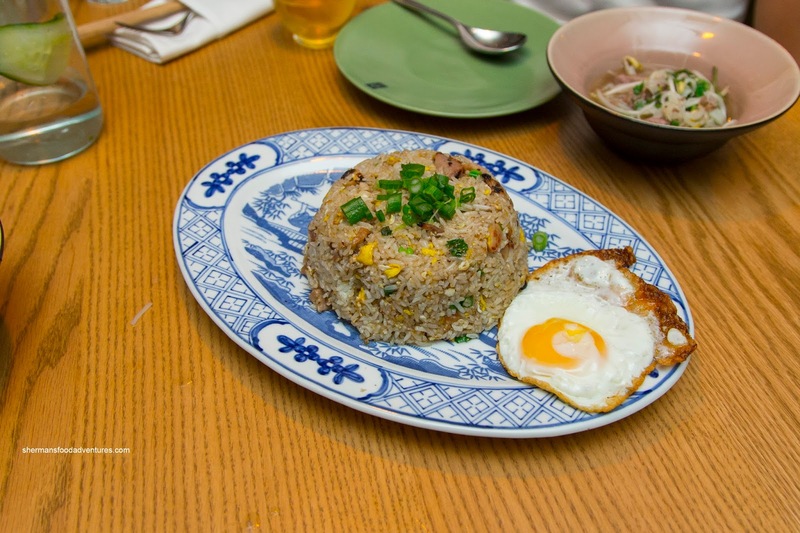 We found that the chili fish sauce was much more impactful compared to the butter garlic. It was slightly spicy, a bit sticky (sweet glaze) and of course salty from the fish sauce. I wasn't sure that the lemon juice on the side really was necessary for this flavour. On the other hand, it was very necessary for the butter garlic as it was rather bland. Yes, there was some hits of garlic, but the wings were underseasoned. At the very least, the lemon juice added a zip. 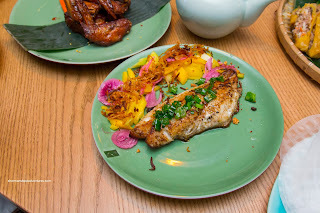 We also got the Cá Chiên or whole red snapper on a bed of mango salad and drizzled with chili fish sauce. Okay, that wasn't really a whole red snapper, rather, it was a fillet. With that being said, it was prepared expertly where the exterior was nicely seared while the meat was moist and buttery. It was also underwhelming in flavour, but the mango salad did its job by adding acidity, sweetness and sharpness from the onions. Majestically plated, the Khay Bánh Hỏi Lụi Nướng was a platter consisting of house-made pork sausage, bamboo pith, beef in betel leaf, grilled chicken, spring roll & grilled prawn. This was a prepare-your-own salad roll dish that had resembled parts of Bo 7 Mon. Definitely interactive and fairly decent. Overall, the food was pretty good, if not expensive for the portion size. However, given the renovations and now fitting into the Main Street hipster scene, I guess there is a price to be paid.